The Aichi Watch and Electric Machinery Company Limited (Aichi Tokei Denki Kabushiki Kaisha) created a number of aircraft for the Japanese Imperial Forces during the leadup to and throughout World War II. The most famous of these was probably the Aichi D3A2 "Val" bomber. The second-most famous was the Aichi E13A1 "Jake". The Aichi E13A1 was designated by the Japanese Navy as Type Zero Reconnaissance Seaplane, Model 11. 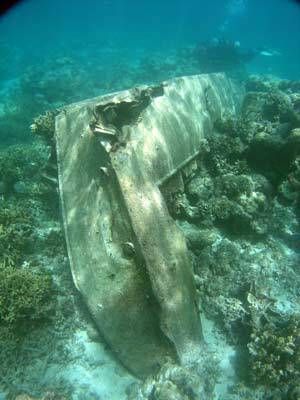 It was three seat reconnaissance aircraft, normally carried by aircraft tenders, cruisers and at least one battelship. It was also based on sea plane bases. The plane was a low-wing monoplane, with all metal (aluminium) surfaces, except for the controls surfaces. It was 11.2 metres long and had a wing-span of 14.5 metres. It was powered by a single 1,080 hp Mitsubishi Kinsei 43 14-cylinder two row radial engine driving a three bladed propeller. This gave a maximum speed of 376 km/h at 2,180 metres and a cruising speed of 222 km/h at 2,000 metres. It had a range of 2,090 kilometres. Empty it weighed 2,642 kg, loaded 3,640 kg and with a maximum take-off weight of 4,000 kg. 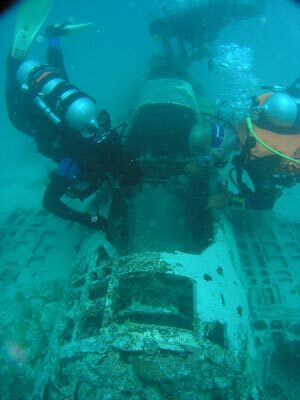 The plane had two large floats attached to the fuselage by struts. Armament was one flexible rear-firing 7.7 mm Type 92 machine-gun. It could also carry one 250 kg bomb or four 60 kg bombs or depth-charges. The plane, like all Japanese military aircraft, was given a nickname by the Allies. These names were all male or female Christian names, given to help simplify communications. The Aichi E13A1 was called "Jake". In the Papua New Guinea province of New Ireland, the capital of Kavieng had a sea plane base. This was located just to the south of the now town centre, opposite the southern end of Nusalik Island (where Nusa Resort is located). There are at least three Jakes located near Kavieng. One of these, called Jake Number 1, is located 930 metres south of Nusa Resort, off the southern end of the reef that runs from the south-western end of the island. 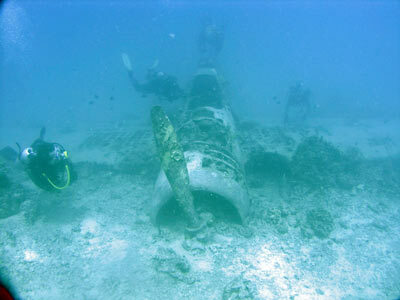 It is a two minute run from the resort to the location, although this plane is normally only done as a third dive using residual air from one of your tanks used earlier in the day. As mentioned, the plane is located right off the southern end of the reef at GPS S2° 35' 27.1" E150° 46' 51.9" using WGS84 as a datum. The plane is visible from the surface as it is in only 12 metres. The plane faces north-east right on the edge of the reef. The prop is marginally shallower than the rest of the plane. The two floats are located on the top of the reef in about 1.5 to 2 metres of water. One of the floats is smashed up as if it hit something. 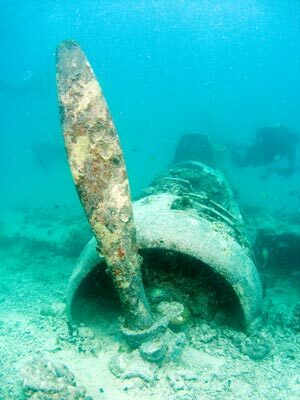 The Pacific Wrecks Web Site claims that this plane probably sank at its mooring however I not not necessarily think this is correct for a number of reasons. Based on the location of the plane and the fact that the floats are separated from the fuselage, my guess is that the plane was heading south-west and it crashed. It appears that the plane's engine was not running at the time as the prop ends are not bent (when a plane hits the water the tips are bent back if the engine is running). It also appears that the pilot was not attempting a normal landing or taking off as the flaps are not extended. I think that the tide was out and the plane approached the shallow reef and one of the floats hit the coral reef, causing it to rip off. The other float came off at the same time. The main section of the plane then spun around and hit the water facing almost back in the direction from which it came. The cockpits are open, which is unlikely if the plane was at its mooring as it would be open to the heavy rain storms that frequently hit the area. Anyway, the plane lies facing the north-east. It is fully intact except for the missing floats and the tail section. The three cockpits are open, the rear gun missing. The prop is intact, although only one blade is fully visible. The others are buried in the sand. The cockpits are basically intact, but the pilot's joystick is missing as are all the gauges. 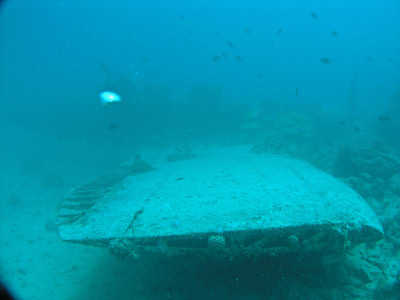 The starboard side inboard fuel tank is crushed, indicating that it was empty when the plane sank. Head up onto the reef in front of the prop and look around. You should soon find one of the floats. The other one is only five metres away at the most. 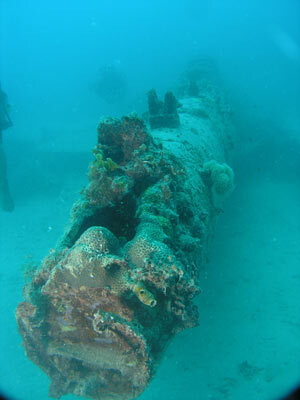 There is also another piece of wreckage here, perhaps part of the tail section. Note that this area is also good for finding pipefish. The visibility here is not great, perhaps only 12 to 15 metres at the best. A nice dive to use up some remaining air. You only need to do about 15 to 20 minutes, say 30 to 40 bar.